Being aware of and in control of your emotions is one of the keys to success in life -- both professionally and personally. Emotional Intelligence For Dummies will show you how to take control of your emotions rather than letting your emotions control you! Discover how developing your emotional intelligence can further your relationships with others, in the workplace and at home. Emotional awareness is also a critical skill for career success, and Dr. Stein provides practical exercises for developing this skill and achieving your professional and personal goals. He also provides valuable insights into how emotional intelligence can be applied to raising children and teenagers and realizing personal happiness. Full of lively anecdotes and practical advice, Emotional Intelligence For Dummies is the ideal book for anyone who wants to get smart about their feelings and reach the next level at work and at home. Steven J. Stein, PhD, is a clinical psychologist and CEO of Multi-Health Systems (MHS), a leading international test publishing company. A leading expert on psychological assessment and emotional intelligence, he has consulted to military and government agencies, including the U.S. Air Force, Army, and Navy; special units of the Pentagon; and the FBI Academy; as well as corporate organizations, including American Express, Canyon Ranch, and professional sports teams. Part I: There's a New Kind of Intelligence in Town. 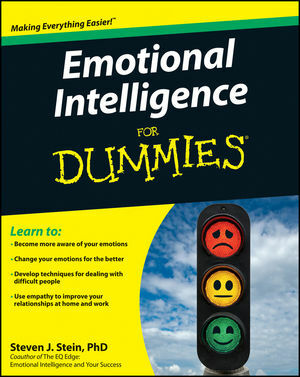 Chapter 2: Assessing Your Emotional Intelligence. Part II: The Essentials of Emotional Intelligence. Chapter 4: Investigating the Science Behind Emotional Intelligence. Chapter 5: Becoming More Aware of Your Emotions. Chapter 6: Managing Your Emotions. Chapter 8: Managing Other People's Emotions. Part III: Taking Emotional Intelligence to Work. Chapter 9: Dealing with Diffi cult Workplace Situations. Chapter 10: Succeeding Through Emotional Intelligence. Chapter 11: Becoming an Emotionally Intelligent Leader. Chapter 12: Creating an Emotionally Intelligent Workplace. Chapter 13: Getting Through College with Emotional Intelligence. Part IV: Using Emotional Intelligence at Home. Chapter 14: Creating Emotionally Intelligent Relationships. Chapter 15: Parenting with Emotional Intelligence. Chapter 16: Raising an Emotionally Intelligent Child. Chapter 17: Ten Ways to Improve Your Emotional Intelligence. Chapter 18: Ten Ways to Help Diffi cult People with Their Emotional Intelligence. Chapter 19: Ten Ways to Make the World a More Emotionally Intelligent Place. Appendix: Resources for Emotional and Social Intelligence.